The outline of the design is sandblasted and the interior is shaped to create a 3-D look to the design. Shape carved designs are commonly used on roses, flowers and leaves. They can also be used on many other designs such as praying hands. This particular type of work consists of placing a design on a rubberized mask, cutting out the lines and outlines of the design and then sandblasting the exposed surface. Sandblast designs are the most basic type of carving available. 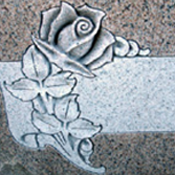 Flat carved roses and other floral designs are not preferred for upright headstones. 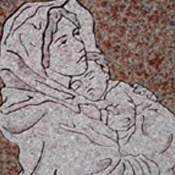 Sculptures and granite statue carvings consist of an image that is hand sculpted using many different pneumatic chisels and other granite carving tools. 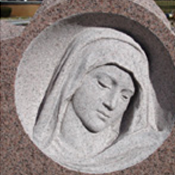 The quality of a hand sculpted statue will vary greatly depending upon the individual sculptor.